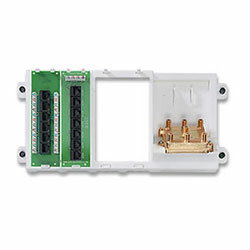 Basic Home Networking Plus Panel combines a Telephone Patching Expansion Board, Category 5e Voice & Data Board and a 6-way 2 GHz Video Splitter in a dedicated plastic bracket for essential telephone, video distribution and home networking. Handles up to four telephone lines through to seven connections. Suitable for phone, fax or modem. The panel also features six connections for voice or data.